Abuja, 25th March, 2019. 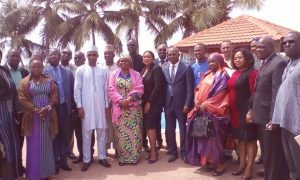 The Heads of the ECOWAS National Offices in Member States were trained on the ECOLink’s Enterprise Content Management (ECM) being implemented across ECOWAS Institutions. The training aimed at empowering the National Offices with the knowledge of the ECOWAS business processes took place from the18th to 21st March, 2019 in Assinie, Côte d”Ivoire. The training which was led by the Commissioner for Finance of the ECOWAS Commission and the Coordinator of the ECOLink Implementation, Mrs. Halima Ahmed alongside the Chairman of the ECOWAS Administration and Finance Committee (AFC)/Head of the ECOWAS National Office in Nigeria, Mr. Nuhu Musa provided participants with Hands-on Training on the ECM. Mrs. Halima Ahmed in her opening statement said that the implementation of the ECOLink’s ECM – Document and Workflow Management System – across all ECOWAS Institutions is aimed at making ECOWAS operations paperless. Mrs. Ahmed stressed that “beyond the need to align ECOWAS with international best practices and modern technology, ECM is set to enforce established rules and procedures in ensuring that business processes are initiated by the required officials and channeled to the right authorities”. She added that ECM will provide assurance for easy tracing of documents and processes and will also create a Central Repository for Documents, which will bring ECOWAS Institutions, Agencies and Offices closer thereby breaking the barriers of distance. The ECOLink project which is being implemented with support from the European Union (EU) will complete its fifth year of implementation by September 2019.